I took an NLP Practitioner Certification a few months back. When people ask me about the NLP Certification, I tell them one word: Healing. NLP is Neuro Linguistic Programming. It is how we use our mind and language to manage the way we think, feel and act. I’ve experience NLP. It is very very likely that you too have experienced NLP in your life, and you just don’t know it. Afterall, NLP is founded on a science that studies how to develop human excellence through modeling. I first encountered NLP in 2007 through what I heard from my friends. Like fellow-PSI grad, Starshooters coach and corporate trainer Raju Mandhyan. I also read about NLP, particularly from motivational speaker Tony Robbins (although he calls it by a different name). I am part of training group called Train Station Inc. One of the foundations of Train Station is NLP. 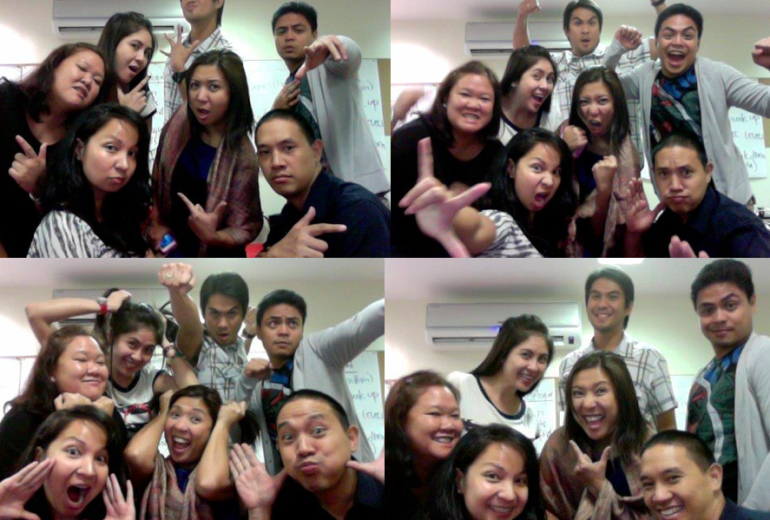 We teach some principles of NLP to our training participants to help them be more effective communicators. We help our participants in relating better to their colleagues, bosses, direct-reports, customers/clients. Of course, the same skills can improve communication with loved ones as well. When we took our 5-day NLP Certification, we went through different patterns — these are processes that each individual goes through to help them break un-resourceful states. When we say un-resourceful, we just mean situations where a person feels weak (emotionally, physically), angry, frustrated, discouraged, lazy, etc. In contrast, resourceful states are states of courage, happiness, determination, spontaneity, clarity etc. The NLP patterns that we went through would range from 10-20 minutes. The amazing thing is that at the end of the pattern, very distinctly, you come out with an empowering sense of control and healing. I do acknowledge that there is a “dark side” of NLP. Just like any tool we have — like a knife, a hanky, the Internet or even Religion — NLP can be used for doing good and it can be used in harmful ways. I’ve seen through videos how some people are able to manipulate others to do funny stuff, like accept plain paper as payment for a diamond ring Note: Search for Derren Brown on YouTube, he demonstrates how a combination of tricks can make people do funny stuff. This is where I realized that the budul-budul gang’s modus operandi is real. They indeed can influence people to do funny things. Our protection from the dark side: be alert, be grounded. Nobody can force you to do anything without your permission (see this video in a subway, you’ll see one guy who was NOT fooled). Now back to the certification. I personally brought in a lot of “issues” and concerns that I wanted to “fix” in my life. For instance, I felt a discomfort each and every time my eldest brother, Elmer, would call or text me. I realized at that time that the reason for the discomfort is that I knew at the back of my head that I had some money I needed to pay him. And, at that time, I wasn’t ready to pay him. After going through a pattern, I got to understand where my feelings were coming from, and I was able to find better ways (more resourceful ways) of responding to my situation. Whereas I was very resistant to my brother at that time, after going through a pattern, I opened up to him. I called him, spoke to him and made peace with myself by resolving to start sending him payments for the real-estate project we had. That was liberating. All within 15 minutes. Right after our Certification, I had the opportunity to help along my friend. Let’s call him Alvin. Now, Alvin was in a state of financial difficulties. He had quit his job a good 6 months ago, and his bills were piling up. At that moment, one of his greatest fears was for a collector to come up to his door and demand payment. When I asked him to imagine himself in the situation where the collector was in the lobby of his building, very strongly his body and his face reacted very negatively. His face crumpled, I could see the pain in his face, his shoulders slouched as if he had a sack of rice on his shoulders. And he started to throw-up. Literally, I had to get a bin to catch his vomit. That was how negatively he was feeling about the situation. And, mind you, we were just “imagining” that the collector was at the lobby of his building. I helped him through one of the patterns we learned. I helped him go into a more resourceful state. I helped him gather all the positive values and resources he could gather and reminded him that he has all these resources available for him. He gathered courage, strength, being free, being pro-active, trusting, having faith and all other resources that he already had. And he empowered himself with these values. All within 15 minutes, we were able to bring him from an un-resourceful state of throwing-up to a state more resourceful state of responsibility and courage. I’ve been able to use what I learned in NLP in many ways. Recently, Rezza (my girlfriend) and I have been encountering our own situations of un-resourceful states. Simply put, nag-aaway kami! We would have arguments about who is responsible for doing this or that, arguments about how we communicate etc. Being both NLP practitioners, Rezza and I now have another common language to speak, a common language to help us understand ourselves better and understand each other better. We are able to shift from unresourceful to resourceful states more easily. And it all builds up. Everything that I’ve learned through PSI, through The Feast, from books like “The Secret” or “Think and Grow Rich”, “Success Principles” etc., many of these principles are actually NLP-related. By studying NLP, I got to understand better why the principles work and how the principles work. Most importantly, I get to try out the principles myself, and experience first hand how it is to be able to empower myself — always with the grace and blessing of our good Lord. I now coach clients through NLP patterns based on what they need. Different folks, different strokes, different ways to heal. Some have chosen to find healing through NLP with my assistance. I am now able to help people break away from the un-resourceful states and find their more resourceful states. This helps my clients find more happiness, more success and more love in their life. I know you’ve wondered whether I can help you with your concerns. Send me a message, let’s discover something good for you. 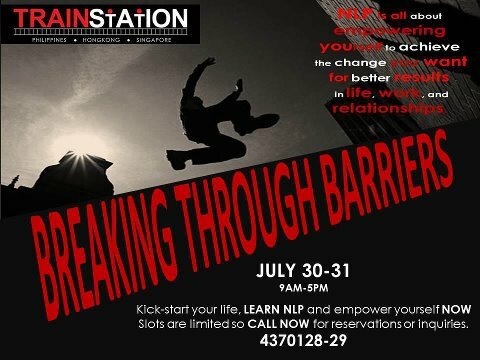 Visit the Train Station facebook page for more details on the next NLP training. 2-day workshop is P10,000 regular walk-in rate (P8,000 if you pay in advance). I know that I have many friends (or even future-friends) reading this blog. I know that you are going through different kinds of challenges in your life, and that it is good for you to come to friends like me, and just release whatever has been holding you back in life. Time to Break Through Barriers. I have always been told by many friends and clients that the healing and growth that they got was phenomenal, almost unbelievable, and what makes it real are the results that they have gained in their lives. More happiness, more success, more love and isn’t this what everybody wants for themselves? It’s time for your to Break Through Barriers! Here’s to more happiness, more success, more love and more breakthroughs in your life! Learn more about NLP Life Coaching. Inquire about the Introduction to Coaching TODAY!